Today is the day. The day I have finally been waiting for. I have been mentioning this perhaps once a day, since valentines day- Go on then girl spit it out! It’s only bloody waffle day!! Depending on where you are in the world, you’ll have waffle day on random days (here in the UK it’s the 24th of March) luckily the Americans have added the 24th of August as waffle day too and I, for one, am not about to complain. Pancake day popped its head around the corner – Yes! Finally a day I could display my new, recipes I had sneakily added a waffle recipe in amongst the pancake day post and no one was any the wiser. But today. Today is waffle day so I can show off! I have treated myself put myself through the pain of making 20+ waffles to find the fluffiest. Sweetest and tastiest waffles out there. Don’t worry if you’re Vegan, Gluten-Free, Paleo or whatever the heck you are. I have you covered – I’ve included several options for you to choose from! The best until last – Of course. Blend All ingredients together using a blender. The batter should be thicker than pancake batter but slightly thinner than double cream at whipping point. 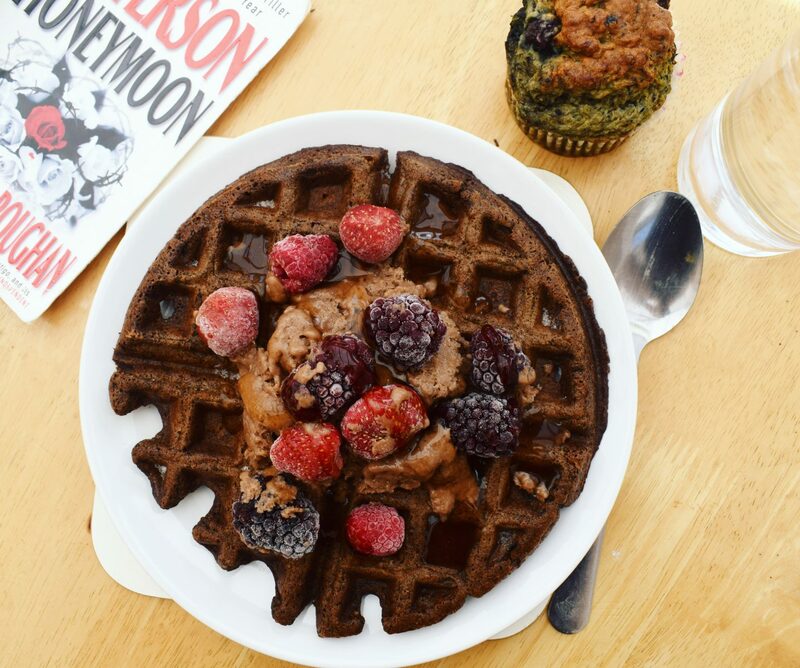 Using an ice cream scoop portion out your batter into a pre-heated waffle iron -Cook for 7-minutes. Courtesy of me myself & I. I’m definitely tooting my own horn with this one because we all have our own types but this one is really soft and spongey (which is my preference). I have just found zero calorie maple syrup from Bulkpowders and am going crazy for the stuff, really embarrassed I haven’t gotten into a full review of the company that makes it but I will. I promise I’ll get round to it but I’ve got a lot in the works over the next few weeks. Like this post? Share it – Pin it! Oh man, you had me at waffle. These are my fav. Ahhh these sound so good! I bought my fiance a waffle maker many years ago for Christmas. We’ve just moved house and pulled it out of the cupboard again so we’re determined to start making some again. I’ll try the easy one first hehehe. And then of course the chocolate one. Ooh I love a good waffle, will definitely be giving these a try! These look so yummy! I love that you’ve given a couple of varieties depending on dietary needs. I’d be picking the chocolate one! We love waffles in this house – so much so I am so tempted to put a waffle maker onto my Santa list this year! 😉 These all look amazing!